Everything Just So: Does Borrowed Bling Bother You? Does Borrowed Bling Bother You? Naomi Watts in a Bulgari necklace at Cannes 2016. Photo by Pascal Le Segretain. 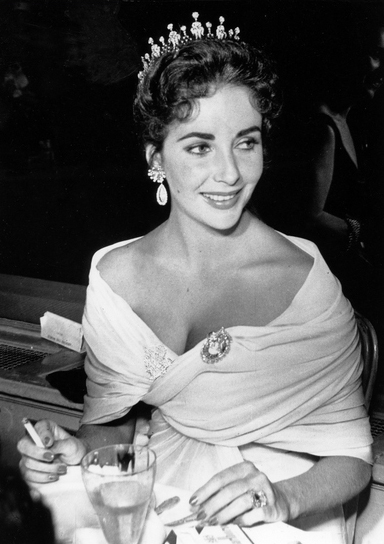 Liz at Cannes in 1957. Photo by Ullsten Bild/Getty Images. French fashion editor/stylist Carine Roitfeld says she doesn’t like that the actresses who show up on the red carpet at Cannes are paid to wear such big jewelry. I don’t mind that so much. I’d do it too, if I were, say, Naomi Watts, above, so resplendent recently in an Armani Privé gown and Bulgari jewels. And it was interesting to read about the various personal pieces owned by Ms. Roitfeld and other stylists. I would expect those gals to wear their own jewelry, why would they be in borrowed finery? They are the stylists! Most people don’t even know their names, let alone what they look like. It seems to me that the publicity garnered by their wearing jewelry from the big houses would be wasted (in my very humble opinion). I think the most famous stylist in the world is probably still Rachel Zoe (and I bet she owns the jewelry she wears). Cate & Rooney at the 2016 Oscars. AFP Photo. I realize that all red carpet dressing is a fantasy so I expect it to be borrowed—the gowns, the jewels, the bags, the shoes, even the dates! If the actresses get paid to wear it too, I say, Why not? If it weren’t for red carpet dressing, most of us would never get to experience, in any format, the pleasure of seeing the most beautifully designed and crafted jewelry pieces on the planet. I don’t know about you, but the thrill of that never gets old to me. It is wonderful to see what such talented jewelry designers, from any house, in any decade, were able to dream up and create. The fun is enhanced by seeing these amazing jewels worn by the lovely actresses we recognize from stage and screen. If actresses want to add their own jewelry to their red carpet look I’m all for it, but let’s face it, can you name one actress who actually owns even one piece of jewelry we ever see? The only one I can think of is Jennifer Tilly. If she ever comes back to the Oscars I beg her to wear her glorious Schlumberger for Tiffany & Co. brooch, seen below. (Liz also owned the same brooch, btw, and Jennifer tried to win it at auction and was unsuccessful. She found the one she does own at a different auction and spent $80,000 on it.) If you know of actresses who turn up wearing their own gems, please let me know! Jennifer Tilly in Crazy About Tiffany’s. She owns that stunning Schlumberger for Tiffany brooch she wears! Until there are more ladies like Jennifer, who has a true passion for jewelry (like Liz) and wears stunning creations from her personal collection, I vote that the red carpet stays awash in borrowed bling. Don’t you? I believe you're absolutely right! I will try and keep this short but I have to say that I was shaking my head when reading the article. First, I think it is a bit rich of Carine Roitfeld and one of the many reasons why she "left" as editor of French Vogue is having a tone of condescension to those who borrow items. I also didn't like the very attempted but failed tone of the writer as well. Why is this even an issue in that circle? Does Vogue buy the outfits they feature in the editorials? Do they even pay minimum wage for models for that matter? No and no. I personally don't borrow items except from my mother but that's me and I won't question if someone else does. The borrowing in real life brings up other issues but in this instance, where else are you supposed to model fabulous jewelled works of art? I mean many people in the industry don't pay for a damn thing including facials and detoxes. When I was at the Mayr - all of the editors and journalists were comped their time there so I feel this is a bit rich if you ask me! :-) I wish there were more people out there wearing their own jewels, like Liz Taylor used to do. But then I again I think men have changed and there are not as many out there showering their lovely ladies in jewelry. Too bad! When I see how Chopard sponsors the Cannes Film Festival and the amounts of jewelry that they give actresses and other VIP's on loan I always wonder who buy them in the end? And is that really beneficial for them (Chopard)?. Mhm. If I were a famous actress I wouldn't mind wearing some beautiful jewelry either. So I'm always happy to see them on your blog, dear Jill! Keeping my eyes open for more. Another great perspective on this event. My only argument against the loaning is the actresses getting paid. I think that makes it harder for smaller, talented designers with less capital to break into these events. To be paid to wear jewelry what a dream but ultimately I would find it hard to give back! It would be hard to afford all the jewelry if you didn't borrow it. I'm all for borrowing stuff for big nights out!!! I'm sure actresses and others own jewelry, but maybe not to that level. And of course they would be expected not to own just a beautiful necklace and earring set, but several (they can't be seen wearing the same pieces every week, can they?) Think about the practicalities. You have to insure it, and you have to keep it (generally) in a safe deposit box or other secure facility. You have to retrieve it and put it back. Just so much easier to borrow from someone who will loan it out. I think the main issue is that when many people look at actors or actresses, they assume that they own or like whatever they are wearing. They may not think of the politics behind it or quid pro quo. Instead, their views of the items are swayed by what may be false conceptions.